We have another teacher in the family! My niece graduates from college with her teaching degree this weekend and so I made her this String Art Sign as a gift for her classroom. In preparation of this project, I enlisted my husband to cut, sand and stain a board for me. While he was busy in the garage, I got to work on the computer and printed out a template. She will be teaching elementary grades, so I chose an easy to read, non-cursive font. After printing, we took a ruler and marked every few centimeters along the letters, so that we would know where to put the nails. Once the stain was dry, (like a day later) we used painters tape to secure the template and then used a drill with an ity-bity drill bit to pre-drill the nail holes. We then removed the template and carefully nailed the nails into the pre-drilled holes. Here's the stained, nailed board ready for the string. I used a variety of embroidery thread in bright, bold colors. All you do is simply tie a knot around the head of one of the nail heads and then outline your letter. Next, zigzag the thread randomly across the letters. When I was done, I made one last outline of each letter for a more finished look. TIPS: The only hints I can offer are to not pull too tight (the nails can bend toward the center if you do) and to try not get the thread knotted as you go. it's a pain to fix. This is awesome. 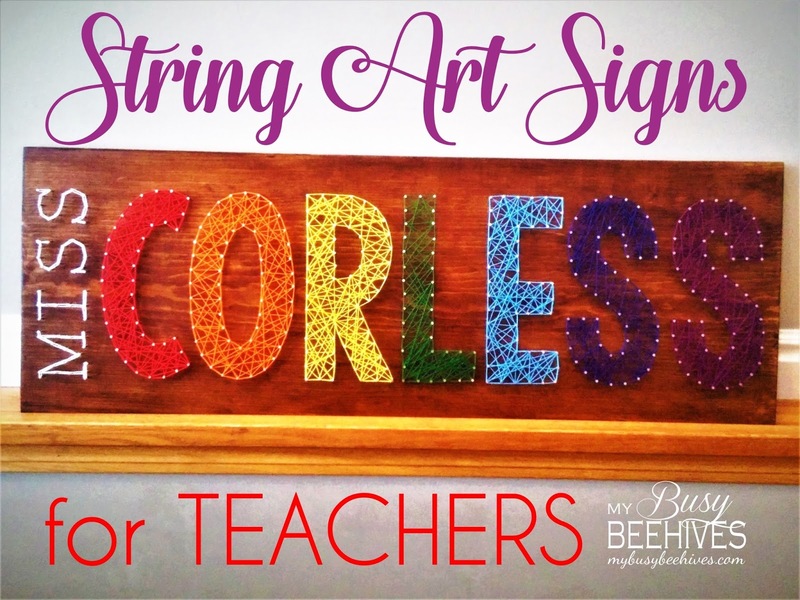 I'm an art and technology teacher and would love one of these in my classroom!! That is very effective. I love the rainbow colours. What a great gift. OMG! This is awesome! I love this idea! Good luck on your projects! I'd love to see how it turns out! This is so lovely, what a beautiful thing for a classroom. What a special gift for the teacher. Kids would have so much fun doing this. Thanks for sharing at Over The Moon Party. Such a good gift idea! Teachers will love this! This is awesome! 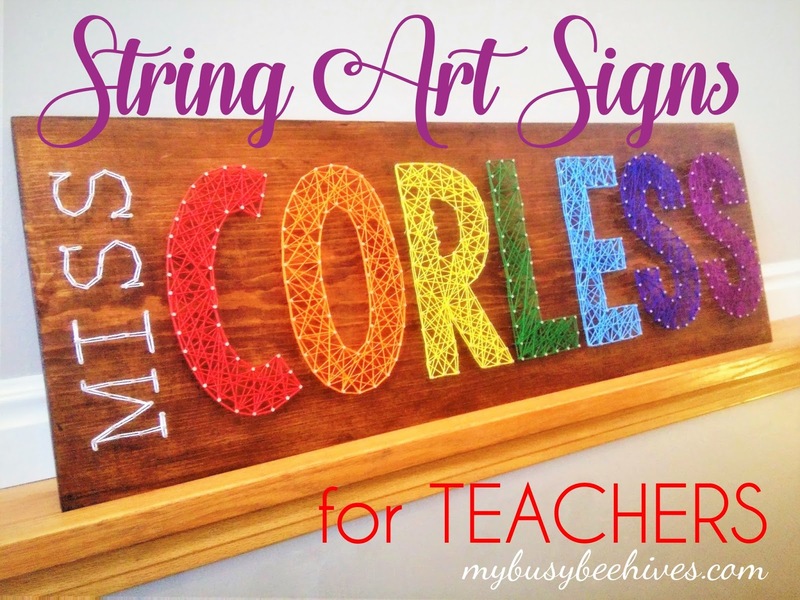 I love the colors and string art is amazing. 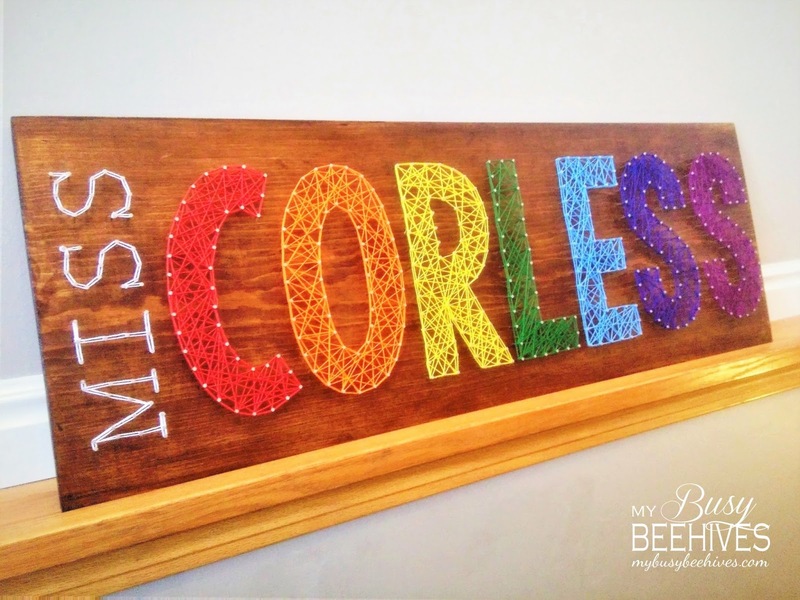 We featured it at Snickerdoodle Link Party this week! Hope you can stop by, Julie. Such a clever gift! I love this! Pinned and sharing. Thank you for joining us at Family Joy Blog Link-Up Party. I hope you will join our next party starting Sunday at noon EST. Awesome!!! I would have loved to have had one like this in my classrooms. #HandmadeMonday. Lovely gift for a teacher. Thank you for sharing at Ravenwould. What a great gift for a teacher!! Thanks for sharing on the Pleasures of the NW's DIY party!